HOME PAGE / THE WORLD JUDO DAY / How to Participate? The World Judo Day is a special day dedicated to Judo allover the world. Thus, if you represent a continental union, a federation, a club or if you are a coach, an educator or a judoka and a judo lover, if you are a judo fan or/and if somebody from your relatives practices judo, you can gather together and participate to the World Judo Day and emphasise the theme of this fourth edition: HONOUR. We have chosen October 28th for many reasons, the main one being that it is the birthday of the founder of Judo: Jigoro Kano. Today, more than 20 millions people practice judo around the world on a daily basis. The IJF counts 200 national federations and five continental Unions. There is not a single spot on earth where judo is not practiced. The IJF wanted to dedicate a day to our sport in order to promote our values and our spirit. Judo is more than a sport, it is an educational tool that can help people to live together and to respect one another. Our objective is the increase the number of judo players around the World. You are the actors and the makers of the objective! We put at your disposal a communication kit (press releases, posters, banners, flyers) that you can use freely to promote your own event). 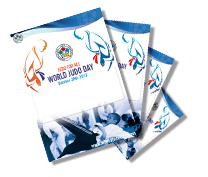 Here are a few examples of what can be organized on the occasion of the fourth edition of the world judo day. There is no obligation but the one to gather together all the judo lovers to celebrate our sport and its values. You can make propositions, invent YOUR OWN WAY to enjoy sharing the same values. You open your club to the public and you present the activity of your association. You invite all your judoka, their relatives and friends, the authorities and the media to explain them what is judo, where it comes from, why it has been invented and what it can bring to you and to them? You organize with other judo associations a joint training. You can also organize a MONDO on the theme of HONOUR to share experiences and exchange ideas on how to promote our values. You organize a conference to talk about judo and about the theme of the fourth edition of the world judo day: HONOUR. You organize an open competition or an inter-club training session where all age categories and all levels, without any kind of distinction, can take part.